Summon legions of extraplanar creatures to your tabletop with this collection of more than 100 creature pawns for use with the Pathfinder Roleplaying Game or any tabletop fantasy roleplaying game! Printed on sturdy cardstock, each pawn contains a beautiful full-color image of a monster from the summon monster spell lists in the Pathfinder Roleplaying Game Core Rulebook. Each cardstock pawn slots into a size-appropriate plastic base from any of the Pathfinder Pawns: Bestiary Box collections, making them easy to mix with traditional metal or plastic miniatures. 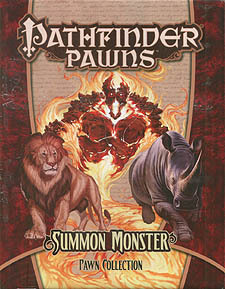 With multiple pawns for commonly summoned creatures, the Summon Monster Pawn Collection is the best way to ensure you've got the perfect monsters to conjure for every Pathfinder Roleplaying Game encounter!